at The Bunker House Lounge. Meet Marco with Firiatto Winery. He embodies the passion and joy of Italy. 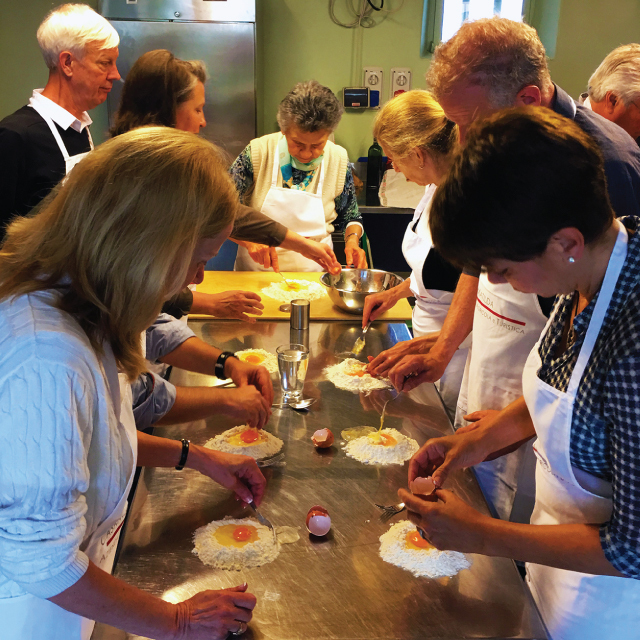 Share a unique evening of fun, food, and wine as he takes us on a sample tour thru Sicily, Teaching us how to cook, drink and enjoy life's simple pleasures with an Italian flare. He will discuss the wine excursion offering next year and invite all to run through the grapevines, swim in the ocean, visit historical sites and - oh drink amazing wine and so much more. Reserve your space now for it is one night only and space is limited. with 6 wonderful wines to experience. You will be welcomed with our Jasmin White wine. Wine with a straw yellow color with greenish shades. Flowery and elegant, citrus fruit enveloped by scents of Jasmin and Mediterranean shrubland. Fragrant and sapid, wide and harmonic; a persuasive fruit with a range of citrus fruits from yellow to red. The highly aromatic indigenous grape variety Zibibbo produces a wine full of style and elegance, charming and graceful, in line with the taste and sun-kissed image of Sicily. Appetizer, Caponata paired with Branciforti Nero d’Avola wine. Caponata is a Sicilian eggplant dish consisting of a cooked vegetable salad made from chopped fried eggplant & more ingredients you will discover during the demo. Branciforti Nero d’avola wine is a red ruby colour, on the palate it’s soft and enveloping. Made from Nero d’Avola grapes, it represents the fruit of a long experience in the most modern vinification technologies, but with a rigorous respect of ancient traditions. Main Dish, Pasta Alla Norma, paired with Santagostino Baglio Sorìa red wine. Pasta Alla Norma is a pasta dish in Sicilian cuisine created originally in Catania, Sicily, Italy. 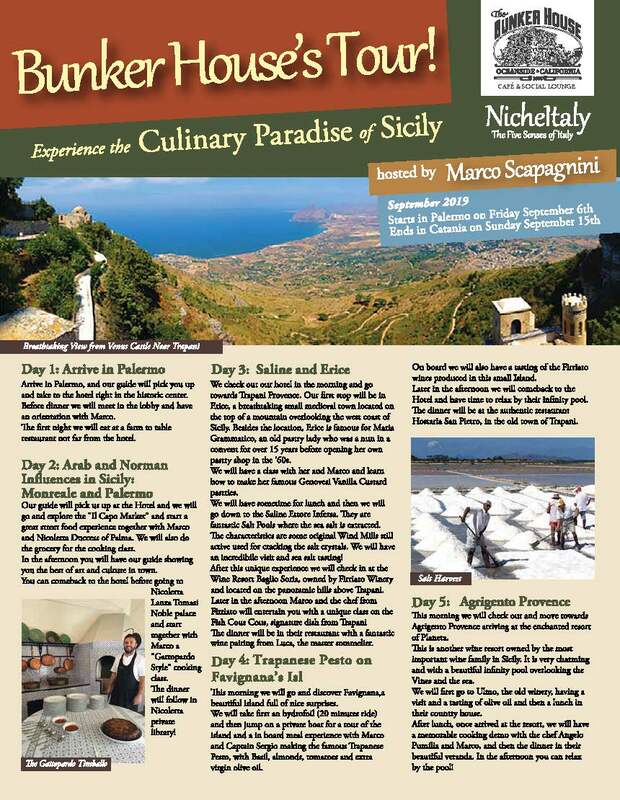 It is made with tomatoes, fried or sauteed eggplant & more ingredients you will discover during the demo. Santagostino Baglio Sorìa wine is a deep intense ruby red color with lively shades of purple. It affords concentrated, well-defined nuances of marasca cherries, wild berries, rhubarb, cloves, aromatic herbs and prunes that alternate and blend with charming hints of licorice, ink and tobacco leaves. Suave, soft and caressing, it reveals its great and intensely Mediterranean character admirably blending a powerful and hearty texture, an extraordinary vivacity, silky and fine tannins. It is a wine that has made the history of modern Sicilian wine-making; it is very appreciated by international markets; complex with a superior character; an incredibly pleasant drinking experience with an almost fleshy fruit; a star in its category. Dessert, Cannoli served with L’Ecru` Passito wine. Cannoli are Italian pastries of the Sicily region. The Italian singular is cannolo, meaning "little tube" but in English, cannoli is usually used as a singular, and cannolo is rare. Cannoli originated in Sicily and are a staple of Sicilian cuisine. You will discover all the preparation and ingredients during the demo. L’Ecru wine is an intense golden yellow tending to amber. You can smell fine scents of orange blossom honey, candied orange peels and dried figs, dates, peaches in syrup, which bland harmoniously with delicate hints of lemon grass, marjoram, sage, oregano and oriental spices. An enchanting texture that unfolds almost with a whisper with all the class of its noble lineage; the expression of warm sun of Sicily enriched by subtle yet deep nuances of the sea and fruit that are both suave and exciting. Aristocratic end reserved, it is a sweet and dynamic nectar with an extraordinary suave and polished persistence to be tasted also alone, in the intimacy of your home, because it makes a fine, powerful, and sensual companion, without ever being intrusive. Etna Bianco & Rosso will also be poured for guests who are just doing a tasting flight. Learn More about the special tour in September 2019.